Greetings one and all! I hope you are doing well and loving life. Once again, I invite you to take a deep breath, pour a cup of coffee or hot tea, and relax. The topic du jour—change! Since we are knee-deep in the spring season, change is an appropriate subject for discussion. Look around. Everything and everyone are changing! Trees are budding. Flowers are blooming. Grass is greening. And people are donning shorts and tank tops. Seasonal change is something many of us eagerly anticipate and warmly embrace. However, other types of change threaten to disturb the tenuous balance of life. Consequently, most people are not fond of change. Over the past eleven years, I have presented thousands of programs on various aspects of caregiving. I can’t discuss caregiving without addressing the issue of change. I always ask those in attendance if they welcome and enjoy change. Change. The word alone triggers anxiety, fear, and discomfort. People squirm in their seats. Look at me in disbelief. Or groan loudly! Obviously, change is not a pleasant experience for most us. 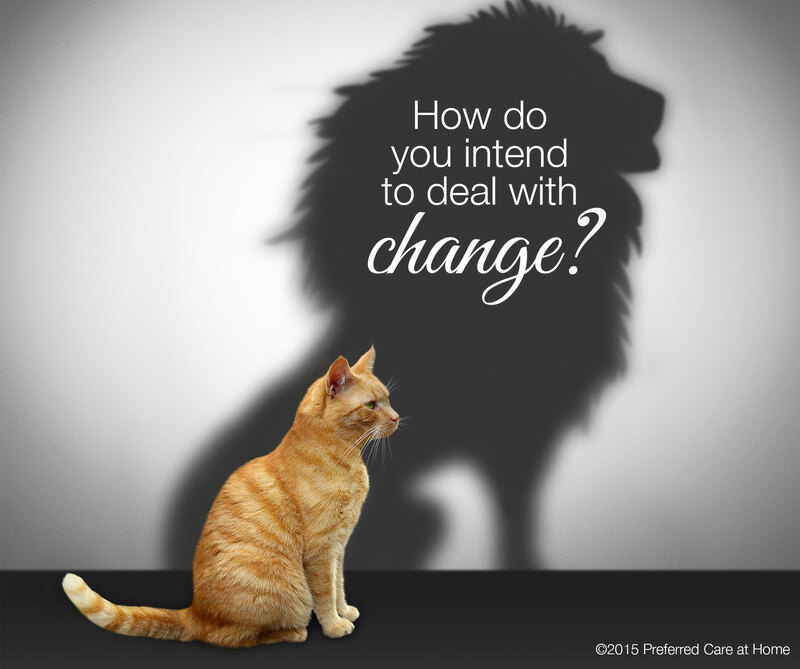 However, change is an inherent part of life—certainly an abiding aspect of caregiving. Change is inevitable and unavoidable. So, instead of fearing change, let’s understand and effectively deal with change. We need to have realistic expectations of life. Change is not the aberration. It is the norm. At birth, there should be a sign in the delivery room that states, “Change Ahead.” We will change physically, emotionally, spiritually, and psychosocially. Every aspect of life is subject to change—relationships, employment, environment, health, and residence. Change can be anticipated or not. Welcome or not. Regardless, change disrupts our daily routines, life expectations, and sense of certainty. Change reminds us that we are not in control! A disturbing experience indeed. The journey of caregiving, like life, is a continuous process of change. Changes, large and small, disrupt the routine and disturb our sense of equilibrium. As noted, this is to be expected. Change is the norm. So, how do we intend to deal with it? Will we be fearful of change—incapable or unwilling to adapt? Or, will we choose to be fascinated by change—courageously confronting the challenges while enthusiastically exploring the possibilities? Fear or fascination? The choice is ours. And the consequences are significant. We can’t control everything that happens in life. But according to Viktor Frankl, author of Man’s Search for Meaning, we have the freedom to choose an attitude in response to life. Our chosen attitude then determines the nature of our lived experience. When fearful, we merely endure life. If fascinated, we engage life. Thus, my fervent hope is that we may all be fascinated by change!